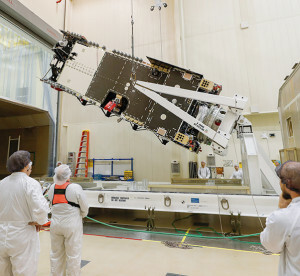 Technicians at Lockheed Martin prepare the Arabsat-6A satellite for shipment to Sunnyvale, Calif., for testing. A new, high-capacity communications satellite that will deliver TV, internet and mobile phone services to the Middle East, Africa and Europe is one step closer to launch. Lockheed Martin has completed assembly on the Arabsat-6A satellite, which was recently shipped to its Sunnyvale, Calif., facility to begin a comprehensive series of tests to ensure the satellite is ready for operations in orbit. 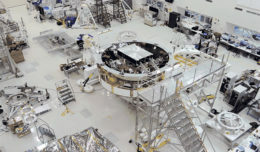 Arabsat-6A is part of the two-satellite Arabsat-6G program for Arabsat and is the second of Lockheed Martin’s modernized LM 2100 series satellites to complete assembly. The other satellite in the Arabsat 6G program, Hellas Sat 4/SaudiGeoSat-1, recently completed assembly and was also shipped to Sunnyvale in November of 2017 for testing. 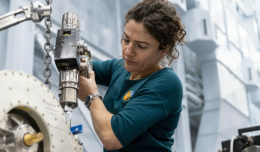 During the trip from Denver to Sunnyvale, Arabsat-6A was housed in a “mobile cleanroom,” which keeps the satellite secure and in pristine condition, free of virtually any specks of dust and contaminants that could damage its precision electronics. 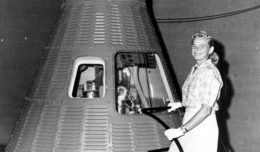 In California, the satellite will undergo multiple tests to ensure it is fit for flight. The satellite will be blasted with sound, exposed to extreme heat and cold, and subjected to a total vacuum to simulate what it will endure during its launch and operations in space. The testing will be completed and the satellite ready for delivery to the launch site by the end of the year.